What I look for in an EDC flashlight? I wanted the flashlight to fit into the little pocket that is usually above the right-side pocket on a pair of jeans (i.e., watch pocket). This narrows it down to mostly 1xAAA flashlights. The Preon1 was a highly regarded EDC flashlight. A simple google search and reading a few forum threads on EDC flashlight that is NOT tactical (e.g., Surefire 6P) keep leading me back to the Preon1. A red one went on sale on Dvor for $22, I bite the bullet and got it. The size was perfect, it fits in my pocket very well. Settings (low & high) are good. I wasn’t going to use “strobe” or “SOS” in an EDC AAA flashlight, but its cool that they were able to pack these setting in this little light. Construction, I was disappointed for several reasons. It doesn’t break easily, but it has a few problems. The housing is slick and smooth, which is pretty, but also quite slippery. The Preon 1 uses a twisting motion to activate the light. It is not the easiest when there are even just a tiny bit sweaty. Some people will mod their Preon 1 to use a clicky cap instead of a twist-type mechanism. I just added grip tape (see picture above) to make it easier to twist. Also, the titanium clip is also less “springy” than most clips, so if I’m trying to clip the light to thinner fabric, it will shift around. In sum, the Preon 1 satisfied me in terms of size and brightness (in low and high). However, I was not happy with some of its design/features. I had to pay $20 extra to make it more reliable for everyday use. After losing my Preon 1 somewhere, I went on a search for a replacement with better clip and serrations/checkering on the body for easier twisting-motion. The Thrunite Ti3 fit those descriptions. It runs on 1 AAA battery, has a solid low and high mode (and a firefly mode of 0.4 lumen, which I almost never use). It is solidly constructed and has serrations/checkering on the housing, and a decent clip that doesn’t bend out of shape easily. All of these, plus being about $10 less than the Preon 1. The serrations on the housing really helped with the twisting motion. It is much easier to handle than the Preon 1. I’ve been using the original pocket clip that comes with the Ti3, and it has never dropped out of my pocket once. There is a little keyring-hole if people want to carry it on their key ring instead. Bonus, the Ti3 came packaged in an aluminum tin which I have converted into an EDC tin of sort. Why I like the Ti3 much better? The Preon 1 has a large following for a reason. The light itself was always reliable. 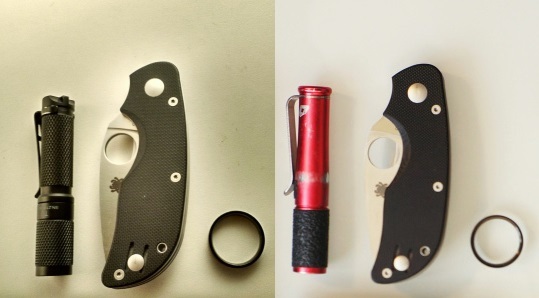 It looked less “tactical” than most other EDC light, which fits in an office setting more. Because of the huge following, the Preon 1 has a lot of aftermarket mods and parts available. This is not something you can find for most flashlights. However, if the flashlight itself can cost $32, a pocket clip mod is $20, which I think is essential if clipping it in a pocket is the method of carry. That makes the Preon 1 a $52 flashlight. A lot of people find the twisting motion hard to use on the Preon 1, so they replace it with a clicky cap for $9. Now this is a $60 light…you get my point. Thrunite Ti3 came out of the box with no major flaws that I could find. $20, done. For me, at least for an EDC AAA flashlight, I’m skipping the Preon 1 even if I’d have to find a replacement for my Ti3 at some point. This by no means take away from other good quality flashlights from FOURSEVENS (e.g., Quark series), but the Preon is just not for me. Why do I even carry a flashlight? ← Previous Previous post: Stippling M&P full-size – How to prepare, practice and go for it! Great review on compact flashlights. I needed a small flashlight for jacket and briefcase carry (work tool). I ordered the Ti3 online from Amazon for $19.95, great price. One idea on the Amazon page was clipping the flashlight to the brim of a baseball cap and it becomes a headlight.